After almost a decade in Downtown Orlando, HostDime Headquarters is moving to a fancy new office in East Orlando, nestled next to the University of Central Florida. We will all miss the sights and sounds of the city. 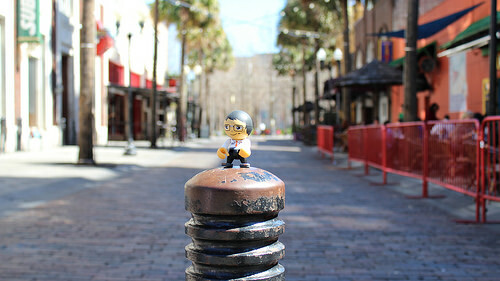 Over the years, HostDime employees have learned the ins and outs of Downtown Orlando, which we will gladly share with you now. 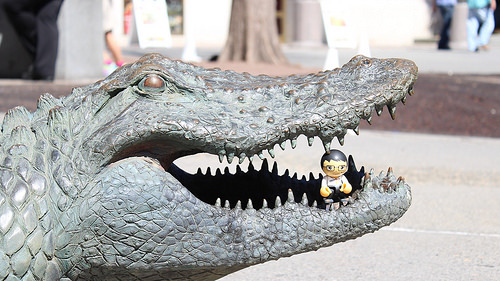 Let HostDime customer service mascot Alex be your guide to the highlights of this beautiful area. The following places are all within walking distance of HostDime’s office. 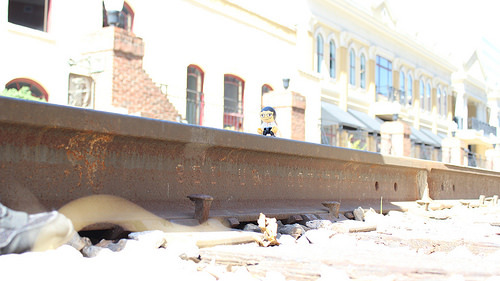 Church Street – Gaze into the past at Church Street train station, which opened in the late 1800s. Located in the heart of Downtown Orlando, Church Street features professional basketball, live entertainment, eclectic nightlife, and renowned restaurants. Plaza Cinema Cafe – Make yourself at home at the giant downtown theater. Watch the newest movies in big leather chairs, while enjoying a full menu, beer and wine. 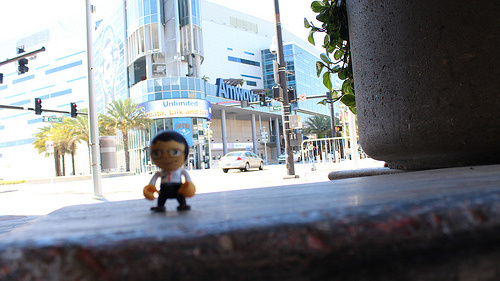 Amway Center – Opened in fall 2010, Amway Center is one of the most modern and technologically advanced arenas in the world. Home to the Orlando Magic basketball team, and the Orlando Solar Bears hockey team, Amway houses over 20,000 seats for large touring artists and acts. Orange Country Regional History Center – This three story museum showcases the vast collections of the Historical Society of Central Florida. Exhibits, exhibits, and more exhibits of historical significance of Orlando, as well as traveling showcases. Perfect for a cheap date night. 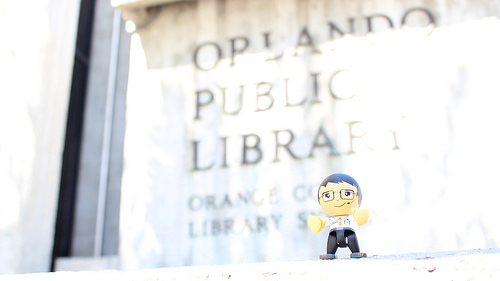 Orange County Library – This here is much more than a library. Not only are there thousands upon thousands of books, you can also download free music and e-books, and access over 250 magazine titles online. Stream movies, TV, music, or audiobooks instantly from your smartphone, tablet or PC. Enjoy Wi-Fi throughout, and take technology classes. Did I mention all of this is free with a library card? The new 26,000-square-foot Dorothy Lumley Melrose Center for Technology, Innovation & Creativity is on the second floor of the library. It includes audio, film, and photography studios, as well as flight simulators and a fabrication lab with 3-D printers. 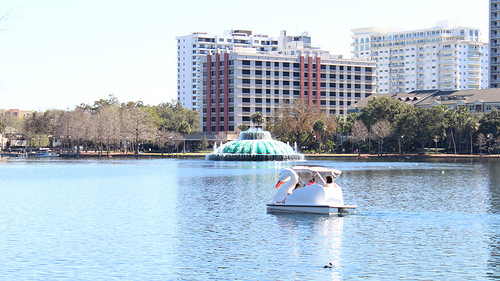 Lake Eola – Lake Eola is a popular, picturesque location, with the fountain in the middle serving as the official icon of Downtown Orlando. Encounter hungry swans around the .9 mile, foot only trail around the lake, or ride around the lake in a giant swan-shaped paddle boat. On Sundays, the Lake Eola Farmers Market is bustling with vendors selling DIY crafts, organic food, and healthy drinks. SAK Comedy Club – SAK is Orlando’s live improv comedy club that seats 200 people, with shows Tuesday-Saturday. Entry is only $5 on Tuesdays and Wednesdays, beer and wine is available to make the comedy funnier. St Luke’s Cathedral – Take a tour or watch a service at the structurally beautifully St Luke’s Cathedral, which was Florida’s first Episcopal Cathedral over 100 years ago. 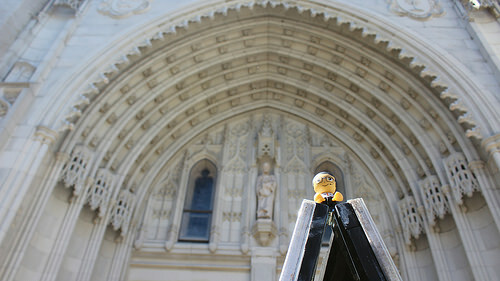 In addition the newly remodeled St. James Cathedral is just a couple blocks away. There are also many other gorgeous churches worth admiring in the area. City Arts Factory – For fans of purty pictures, check out the local and international artists featured at the City Arts Factory. Free admission Tuesday through Saturday from 11 a.m. to 6 p.m.
Grand Bohemian Gallery – The Grand Bohemian Gallery is in the Grand Bohemian Hotel and spills over into the local Starbucks. 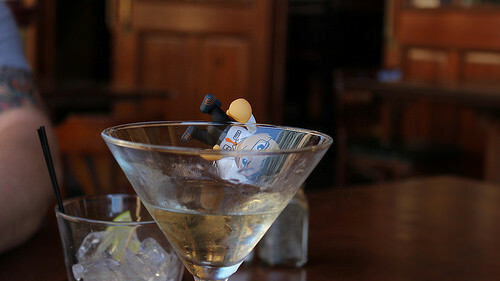 The upscale hotel is famous for it’s scrumptious brunches and live jazz evenings. Le Gourmet Break – Best croissants in Orlando hands-down, not to mention sweet pastries and unique sandwiches. Open early for breakfast and lunch. Ceviche Tapas Bar & Restaurant – Named #1 restaurant in Orlando by USA TODAY, and for good reason. Ceviche on Church Street serves more than 100 tapas inspired by old Spain recipes. Harp and Celt Irish Pub and Restaurant – The Harp is the restaurant, The Celt is the pub. Both reek of authentic Irish influence inside and out. Get yourself some fish and chips with a Guinness while watching a live soccer game. Gringos Locos – Orlando’s local version of Chipotle, Gringos offers giant burritos for $7. Open until 3 AM every day. Kres – Kres is one of the best reviewed restaurants in Downtown. Both trendy and classy, the servers are extremely attentive and the food is worth the price. The filet mignon and beef wellington are both recommended. Avenue Gastrobar – Gastrobar? What kind of sorcery is this? Actually it’s a pub, lounge, bar hybrid that “welcomes beer drinkers and cocktail swiggers, fussy eaters and foodies alike.” Try the chicken and waffles or the croissant donut (cronot). Panino’s Pizza – Panino’s is good at 1 PM, but it’s great at 1 AM. The perfect food after a night downtown. The lunch special also rocks: $5.50 for two giant slices, two garlic knots, and a drink. Frank & Steins – Drink from hundreds of common and rare craft beers while catching a game, playing skeeball, or beating your friends at board games. For food, there’s over 10 hot dogs to choose from, including the Sriracha bacon mac-n-cheese dog. Ember – A hoppin’ Orlando hotspot with one of the best patios in town. Live music and plenty of outdoor seating while indoors features a gorgeous Mediterranean interior. Lattitudes – Looking for a little tropical chill in your evening out? Latitudes is a casual rooftop bar perfect for balmy Florida evenings. If you get bored, go down one flight to Big Belly Brewery (which was secretly open during the prohibition), or down two flights to the bustling Chillers where frozen drinks are the name of the game. Wall Street Plaza – 1 side street, 9 bars: Cantina, Other Bar, Hen House, Hooch, Loaded Hog, Monkey-Bar, One-Eyed Jack’s, Shine, Waitiki, with fun events happening monthly. This is the place to be for Taco Tuesdays. Tanquerays Bar and Grill – This former underground bank vault has been serving up strong drinks since 1989. Stick around for the great live music. Smokers welcome. Tap n Grind – Looking for craft beer? Head to Tap n Grind right next to the train tracks. This place would fit in nicely on the California coast with its surf boards, chalk boards, wave paintings, and chill atmosphere. Hanson’s Shoe Repair – This new speakeasy is one of the best kept secrets in downtown. Call 407-476-9446 between 11am-10pm and say SPEAK EASILY, and Hanson’s will contact you later that day with the evening’s password. Go through NV bar on Pine Street, head to the second floor, ring the door bell, say the password, and enjoy powerful, expensive cocktails in an intimate setting. Well, that’s Downtown Orlando in a mile wide nutshell. If you are a local, please comment and add to the list. While in Orlando, head over to HostDime’s state-of-the-art, 25,000 square foot datacenter, located 10 minutes from downtown. Set up a tour appointment and we’ll gladly accommodate you. HostDime is proud to call Orlando home. 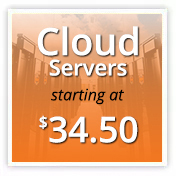 We are one of the top 50 web hosts in the world. Follow us on Twitter and Facebook. This article was written HostDime’s Content Strategist Jared Smith.